FightingArts.com is pleased to be able to present you with the first interview in English with Okabayashi Shogen Sensei, founder and headmaster of the Daito-Ryu HakuhoKai organization. The interview was conducted in Montreal, Canada, in March of 2002. Most readers will know little, if anything, about Daito-Ryu. It is an ancient and classical samurai system of jujutsu and self-defense (against single and multiple, armed and unarmed attackers) that is today, especially in Japan, undergoing a resurgence. Many new organizations and competing systems have sprung up and enrollment has surged. The art also served as the technical inspiration for aikido as well as the fountainhead for many successive systems of jujutsu and what is called aikijujutsu. Okabayashi Sensei himself is a private man, who avoids the politics within his art, as well as publicity in general. He prefers instead to teach almost anonymously to his own dedicated students. While he is not well known, Okabayashi Sensei represents a new and important movement within this very old art, an effort to reintroduce the old ways of samurai movement – a unique combination of moving the body along a single line (known as hitoemi), and using the center and gravity – back into technique. This is no small feat, since the old ways of moving had been largely lost and the methods so foreign to most martial artists today that it takes years of training to master them. It is also somewhat amazing that Daito-ryu survived at all. It was a secret system first developed within the powerful Minamoto clan, then passed down through the Takeda branch of the family which had moved to the Aizu province and taught it to samurai there – a process of development and refinement that stretched over a period of nearly a thousand years. The Aizu clan, however, virtually ceased to exist in the last days of political and military turmoil ending the feudal era. Defeated by rival clans, its castle was burned, leaders taken prisoner and members killed or disbanded. With the new Meiji administration (1867), the feudal period itself abruptly ended. The samurai lost their position and were dispersed, and the old military ways were abandoned. Japan emerged as a changed nation. The old ways were gone and forgotten, and samurai themselves passed into the mist of past history. In the beginning of the 20th century, stepping from the mist of this history as if a man out of place and time, emerged a surviving Aizu trained warrior, Sokaku Takeda, who began teaching his ancient daito-ryu art to the public. Over the next four and one half decades Takeda instructed literally thousands of people, primarily through a series of seven to ten day seminars. Daito-ryu thus survived. The art emerged again, led by a number of great masters: the best known being Tokimune Takeda, son of Sokaku Takeda, who inherited the system from his father; Takuma Hisa, the only person who received the highest teaching license in the art, known as a menkyo kaidan, from Sokaku Takeda; and Morihei Ueshiba, who went on to found aikido. Okabayashi Sensei was a principal student of the first two of these teachers, studying both Daito-ryu as well as the Aizu clan sword art, Ono-ha Ittoryu kenjutsu. Q. Sensei, when and where were you born? A. I was born on June 27, 1949 in Ashia City, Japan. Q. When did you first become involved in martial arts? A. I started training in Shito Ryu Karate when I was about 15 years old and trained in that style for about 6 years. Q. When did you begin training in Daito Ryu Aiki Jujutsu? A. I was about 21 years old when I started training with Takuma Hisa Sensei. So it was in 1970. Q. Why did you stop your karate training, and how did you begin your training in Daito Ryu? A. I had an incident with some a Yakuza fellow (Japanese underworld). I was out one night with my girlfriend, and he started being rude to her. I intervened and asked him to stop, after which he became aggressive and attacked me with a bokuto (a wooden sword). Since I practiced karate, I was quiet strong with my fists and knew I could cause a serious injury if I punched back, but I did not want to hurt him badly. So all I could do was block the strikes of the stick with my arms. Finally he gave up and left me alone. However, after this fight my arms were swollen and hurt for two months. After this incident I thought hard to myself, “what if that was a sword and not a stick I was attacked with? I would have lost my arms.” So I began to search for a martial art that would teach me how to defeat the sword. After about a year of looking for a school, I came across Hisa Takuma Sensei’s group (teaching Daito-ryu Aikijujutsu). I found the things they were practicing very interesting. Hisa Sensei had traditional technique, so I asked him if I could study under him. He accepted me and so I began my training. Q. How long did you train with Hisa Sensei? A. I trained under him until the late seventies, up to the point when Hisa Sensei became frail and his son asked him to move to Tokyo so he could take care of him. Q. How was your training with Hisa Sensei? A. With time Hisa Sensei became frail and he could not move very well. So he would usually teach by speaking and explaining how to do the movements, and demonstrating them slowly. Senior students of Hisa Sensei and I came together and formed what is now know as the Takumakai (Takuma from Hisa Takuma and “kai” meaning organization or socieity, a group dedicated to teaching daito-ryu techniques as taught by Hisa) practiced the techniques, working them out under Hisa Sensei's direction. The training was good and we worked hard. At the same time I felt there was something missing in the movements, there was some element that wasn’t there. I endured these feelings and continued my training. After this period Hisa Sensei moved to Tokyo upon request of his son, so his son could take care of him. When this happened I was going to quit my training. I went to see Hisa Sensei to ask his permission to quit. When I told him my feelings, he said “no, you must continue to practice, I will introduce you to a very good teacher”, and wrote me a letter of recommendation to go see Takeda Tokimune Sensei in Hokkaido (a northern island of Japan where Sokaku Takeda has lived before him). Q. How was Hisa Sensei as a person? A. His was a very interesting person. He liked to try many news things. For example, he learned how to fly an airplane, and played golf when it was not as popular as now. He enjoyed life and was a very good, kind man. Q. When did you receive your kyoju dairi from Hisa Sensei? A. I received it in 1976. Q. So after the recommendation from Hisa Sensei, you went to train with Takeda Sensei? A. That’s correct. I went to Abashiri, Hokkaido to learn from Takeda Sensei. From him at first I learned basic techniques, the shoden . The Takumakai (Hisa’s organization) did not have these basic ones; they practiced more advanced waza (technique). Q. When did you first meet Takeda Sensei? A. Twenty five years ago, so it must have been 1977. A. That’s correct. Because I went with to study under Soke (here used to refer to Takeda Tokimune Sensei) with Hisa Sensei’s recommendation, in Japanese thinking it was as if I was learning from both teachers at the same time. I also took the shoden waza (first group of techniques noted above) and brought them back to the Takumakai. Q. How was your training with Takeda Sensei? A. I was in pretty fit shape at that time because I did a lot of skiing and played a lot of soccer. Although feeling strong, I put myself on a 100-day program before going to see Soke to prepare myself for training with him. When I went to see him, I was fortunate because Soke quit his work right before I got there. We would have one-on-one training in the morning, from 5 a.m. to 8 a.m., then a break until lunch, and more one-on-one training after lunch until the evening. Then there was an evening class with other students. When training with Soke, I was never allowed to throw or apply a technique on him; I was always the uke (the person who a technique was done to) in our one-on-one training. Takeda Sensei taught me by doing the techniques on me over and over again. This was very hard on me at first. You can be uke for one hour, one-on-one, but it was three hours in the morning and more after lunch! In the evening Soke had a class with other students, and I got to practice and apply techniques on others that I learned during the day with Soke. After the third day with Takeda Sensei, I started to feel the toll of the training, because it was so severe since I was always the uke (the person on which a technique is executed). Although I was growing weary, I decided I was there to train and persevered, and in a short time I got used to this kind of training. Practicing with Soke, I was given permission to teach the Takumakai (Takuma Hisa’s Organization) up to the nikajo level, sixty techniques. At the time we were about 15 students at Soke’s dojo, some of the known names being: Arisawa Sensei, Kato Sensei, Saito Sensei, and the sempai was Akimoto Sensei who passed away at the age of 85. Q. How was Takeda Tokimune Sensei as a person? A. He had a very good heart. After the war, Soke was a police officer and later became a detective. He was a very suspicious person, always suspicious of every one so this must have helped him with being a detective. He probably inherited some of these traits from his father, Takeda Sokaku. Q. Did Soke (Takeda Tokimune) speak a lot about his father? Tell many stories? A. Soke never called his father by saying “father”, he always referred to him as Takeda Sokaku. He did not really think of him as a father. When Soke was 10 or 11 years old, Takeda Sokaku was approaching 70 years of age. Soke (Takimune) learned kenjutsu from his mother until five years old, and after the age of five he learned from his father. Takeda Sokaku trained him very hard. He did not have techniques to teach specifically to children. 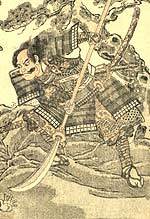 He would have his son attack him with a sword, then he would disarm soke (Tokimune) and the sword would go flying into the snow. So at five years old Soke (Tokimune) would have to go searching through the snow with his bare hands for the sword, pick it up and attack his father again. Once again the sword would fly into the snow, and this went on again and again. This is just an example of how Takeda Sokaku would treat and train his son. It was difficult for Soke (Tokimune) to think of him as his father. One day Takeda Sokaku was sleeping, and Soke wanted to put a cover over him to keep him warm. Sokaku, always being in a state of awareness even when sleeping, grabbed his dagger and went to stab Soke in the heart just as he was about to put the cover over Sokaku. Toimune was barely quick enough to move to the side. He got off the line and the dagger that was going for his heart stabbed him in the shoulder. Afterwards Takeda Sokaku scolded his son severely, saying: “What kind of a fool are you?! You should never carelessly come up one someone by surprise. It is your fault that you were stabbed; if you were aware I would not have cut you!” That’s the kind of man Takeda Sokaku was, so it must have had an effect on Soke. He did not feel as Sokaku being his father. Q. Did Soke use dan rankings when teaching? A. Yes, Takeda Sensei used the dan ranking system that originally comes from judo. He also gave out other licenses like the menkyo and shihan license I have. Takeda Sensei also gave two kyuoju dairi, one to Suzuki Sensei and Minamo Sensei, who have both passed away. When giving dan grades, in reality Soke never gave past fifth dan. Q. How many years did you train with Takeda Tokimune Sensei? 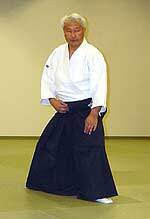 Q. Sensei, you also learned Ono Ha Itto Ryu (the Aizu clan kenjutsu or sword system) from Takeda Sensei? A. That’s correct. I was one of only six people to be taught Itto Ryu by Soke. He chose to teach it only to people with a good heart, because through kenjutsu you can better understand jujutsu. Q. When did you receive your certificates from Soke? A. I received the shihan license in Daito Ryu and menkyo (a license to teach which was the highest given out by Soke) in Ono Ha Itto Ryu in 1985 from Takeda Sensei. Q. Sensei how was the Hakuho Kai born? A. 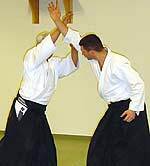 When training with Hisa Sensei, I felt that there was older body movement involved behind the techniques. And when training with Soke (Tokimuni Takeda), I saw that he absolutely did not do any kind of turning (body twisting or pivoting) and always moved (his body) in one line. Okabayashi Sensei demonstrates the initial move in ippon dori with Rod Ulher. 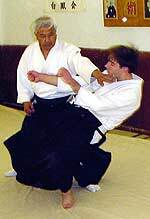 First sensei releases his right leg to let his body move forward with gravity – a movement that bridges the distance to the attack while also letting the defender move under the doward strike. At the same time, the left arm moves up from below, so the palm of the hand meets and momentarily stops the downward strike by catching the attacking arm under the elbow. The right arm is also lifted and positioned, ready to then guide the attack down and to the side, guided by sensei’s body that also opens up in that direction. Many of his students, however, made turns and circles and did not do the techniques the way that Soke did. For example, many would jump, or rise into ippon dori strike (sensei then demonstrates this technique) instead of releasing (the body to let it fall forward). From watching Soke I knew this was not correct. I followed closely how Takeda Sensei would move and researched the techniques. At the time I was with the Takumakai, and I taught these things to my own branch dojo. With time it became a difficult situation because other people were doing and teaching techniques in a different way, and did not have the same idea. Even before Takeda Sensei passed away, there were already disputes about who will be the next Soke (hereditary master of the system), and about this license and that license. Takeda Sensei did not want to have any part of this and did not want me involved in it either. He told me to stay out of all the politics, and told me to go on my own and not stay with an organization. He wanted me teach the techniques he taught me. With his encouragement I decided to form the Hakuho Kai. Sensei here demonstrates a basic principle of the old samurai body movement (hitoemi, or moving in one line). Here Okabayashi Sensei uses gravity, not muscle, to let the body shift backward while also coordinating movement of the shoulder, arm, hips and feet together along a single line. In this instance Sensei shifts backward to demonstrate how to open the body up to avoid a thrust or other straight line attack. Here seen in a NYC seminar, Oakabayashi demonstrates a follow up to this same move. First having shifted backwards and opened up to avoid a straight punch, Sensei then slightly opens his hip to shift his body in a new direction (forward at an angle) a move that totally unbalances the attacker. Q. Sensei, how did you research the techniques and develop your method of teaching? Here an Edo period woodblock print depicts a samurai cutting down with naginata (a staff with a blade). Notice how the body is kept in line, the right arm coordinated with right side of the body and weight dropped into the cut – a perfect example of the hitoemi principle. Also, notice how the body position parallels that of Okabayashi Sensei’s sword cut shown above. A. I watched very closely how Soke moved (Takeda Tokimune), and he was always moving in hitoemi -- one line (moving the body in one line so there are no twists in the body or pivots in movement). I looked at old paintings of the bushi (an old Japanese term meaning warrior), and their bodies were also always portrayed as being in a hitoemi position because that is how the bushi moved. I read old history texts about life in old Japan and how things worked back them. Through all of this I did not find anything in particular, but there were hints here and there. Then, when researching the techniques, we had (the Tokimunikai) pictures of the beginning of a technique and the end of a technique, but could not make certain techniques work (the photos were taken at the Asahi News by Hisa Takuma when Takeda Sokaku was teaching there to document the techniques taught). I asked myself why have a technique that doesn’t work? So by applying my knowledge from Soke and my research, applying hitoemi and gravity principles, I could make those techniques effective and efficient. Q. Sensei, what does “Hakuho Kai” mean, and why did you chose this name? A. “Hakuho” means “white phoenix”. You see, in Japan’s history there were a lot of different eras, like the “Edo” era, the “Meiji” era and so on.... If you go back through history, there was an era called “Hakuho”. It was a time when the Japanese decided to stop outside influence from coming into Japan. It was an era when the Japanese were protecting Japanese culture from outside influence. I want to preserve Daito Ryu in its traditional form and keep the old movements of the bushi behind the techniques, and not to let modern body movement influence it. This is why I chose the name Hakuho Kai. Q. Sensei, are dan rankings used in Hakuho Kai? A. We use the dan ranking system. It is important to note that permission to teach is not the same thing as rank. In Hakuho Kai one must have a good heart and good intentions to have permission to teach. Q. How many Hakuho Kai dojo are there, Sensei? A. Let’s see, there are three in Italy, one in England, three in the U.S., one in Canada, and fourteen in Japan, in the Osaka and Fukuoka areas. So that’s four in North America, four in Europe, and fourteen in Japan, making 22 dojo and about 420 people in all. I am happy all of our members are good people and have the right samurai spirit. Q. Thank you very much Sensei, and thank you very much Rod for doing a great job at translating. Editor’s Note: The language in interview was edited for clarification. Notes (shown in parenthesis) were also included to add pertinent information for the reader. Thanks to Okabayashi Sensei for his contribution of several photos and to Christopher Caile who supplied the majority of the photos in this article, plus the image of the Samurai woodblock print. This interview is for viewing only. It may not be reproduced or reused in any other public forum or medium without the proper consent and authorisation of the Koryukan Dojo and the Hakuho Kai.